* Burton Mutual AA, Trent and Mersey Canal , Marston’s Brewery (Div.1 National G section). Sun, 37. 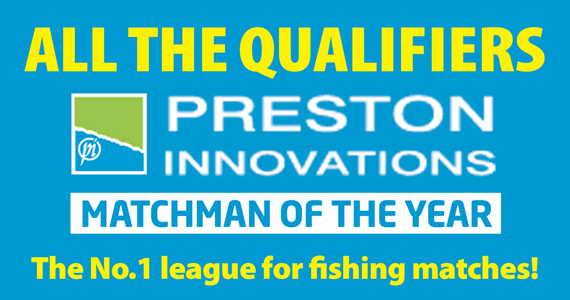 Pat MacMillan (Matrix Halifax) 7-2-0, roach to 1 lb, poled maggot or caster; Martin Lane (Wellingborough AS) 3-3-4; Daz Shaw (Matrix North West) 2-12-8; Stu Campbell (Matrix Halifax) and Stu King (Dynamite/Matrix Trentmen) both 2-12-0; Rob Perkins (Dynamite/Matrix Trentmen) 2-7-0. * Cross Drove, Hockwold, Norfolk. Sun (Jul.7), 31. Dave Pearce Jnr (Wisbech) 111-4-0; Richard Bond (Bury St. Edmunds) 70-4-0; Jamie Thompson (Cross Drove) 59-11-0. 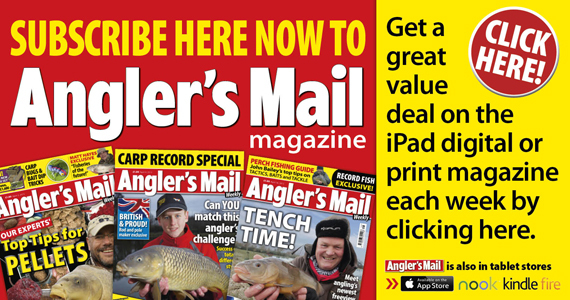 * Fish For 5 + 5 k Qualifier, Water Meadows Fishery, Chapel St. Leonards, Lincs. Sat, 32, Moat Lake. Ashley Pimperton (Water Meadows) 96-14-0, carp to 6 lb, barbel to 4 lb, poled dead red maggot, peg 18; Bob Smith (Water Meadows) 62-4-0; Terry Caughtry (Water Meadows) 55-14-0; Ken Haywood (Water Meadows) 47-8-0; Chris Bonsall (Water Meadows) 45-15-0. Qualifiers: Bob Smith, Terry Caughtry, Ken Haywood, Steve Blankley. Sun, 32. Wayne Smith (Match Catch) 86-12-0, carp to 6 lb, barbel to 4 lb, poled caster, peg 46; Michael Elliot (Matrix Trentmen) 83-10-0; Chris Bonsall (Water Meadows) 74-10-0; Mark Griggs (Boston) 72-4-0; Ashley Pimperton (Water Meadows) 63-9-0. Qualifiers: Martin Kenyon, Trevor Bingham, Michael Elliot, Wayne Smith. * King of the Fens, Middle Level Drain, Outwell, Norfolk. Sun, 60. Steve Winter (Maver Bait Tech) 44-12-8, 15 bream, tip fished worm and caster feeder, 15 pegs below St. Peters Bridge; Doug Botley (Stanjay Sports) 20-9-8; Daniel Webb (Garbolino Black Horse) 17-7-0; Neil Smithson (Garbolino Lincs County) 15-12-0; Rob Wright (Browning Hot Rods) 14-15-0. Teams: Maver Image 60; Maver Bait Tech 55; Browning Hot Rods 53; Garbolino Black Horse 52; Sensas Mark One Black 51; Garbolino Lincs County 42; Sensas Mark One White 41; Sensas Mark One Magic 38; Stanjay Sports 36. League: Sensas Mark One White 10; Browning Hot Rods 11; Maver Image 11; Garbolino Black Horse 12; Maver Bait Tech 13; Sensas Mark One Black 19; Garbolino Lincs County 20; Sensas Mark One Magic 21; Stanjay Sports 27. * Lakeview Fishery, Holwell, Leicestershire. Sun, 35, Marina, Oasis, Stream and Harbour Pools. 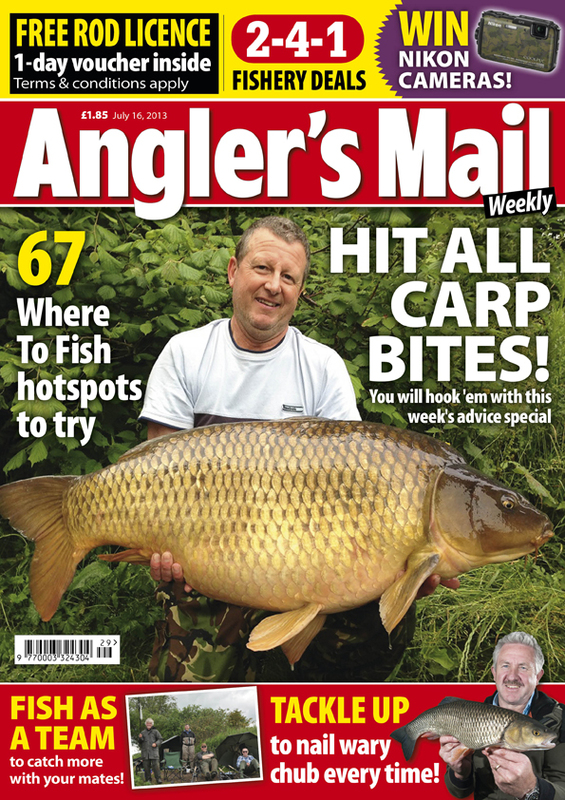 Kevin Kania (Avanti Used Tackle) 84-0-0, carp and silvers, poled pellet, Harbour 12; Carl Hitchcock (Mill Tackle) 80-7-0; Roger Marlow (Leicester Sensas) 79-1-0; Michael Corker (Lakeview Select) 74-10-0; Steve Draper (Lakeview Select) 73-8-0; Steve Gardner (Lakeview Select) 73-14-0. * Nisa Feeders, River Yare, Beauchamp Arms, Buckenham, Norfolk. Sat, 42. Reg Bryanton (Deben) 20-8-0, roach to 12 oz, poled caster over groundbait, peg 140; Chris Sykes (Daiwa Angling Direct) 20-2-0; Mick Hanks (Daiwa Angling Direct) 19-0-0; Paul Abbot (Deben) 17-0-0; Mick Dossena (Great Yarmouth & Norfolk County) 15-9-0; Glen Carter (Nisa Waveney) 14-11-0. * Sherwood Forest Fishery, Edwinstowe, Nottinghamshire. Sun, 30, Holmedale Lake. Lee Hassett (Gateford Angling Supplies) 134-14-0, carp to 9 lb, poled meat and bread, peg 56; Andy Lakey (Worksop Angling) 55-12-0; Nigel Shipman (Sherwood Forest) 48-12-0; Kevin Allcock (Sherwood Forest) 45-7-0; Matt Malia (Wickersley Angling Centre) and Craig Brazier (Sherwood Forest) both 38-11-0. * Westwood Lakes , Wyberton, Boston , Lincolnshire. Sun, 32, £1000 qualifier, Skylark Lake. Stewart Bracey (Shimano Dynamite Baits) 112-6-0, carp, poled worm and caster, peg 3; Luke Morley (Sensas A4) 100-6-0; Marc Rodgers (Middy/Bag’em) 85-12-0; Paul Harsley (Dave’s Peg) 71-0-0; Mick Stamp (Sonubaits) 67-0-0. Chestnut Pool, Langford, Beds. 12. Rob Heath (Chestnut Pool) 85-11-0, bream to 6 lb plus large skimmers, poled sweetcorn/pellet, peg 24; Steve Cullen (Ely) 65-0-0; Clive Coles (St. Neots) 49-8-0. Colton Lakes, nr Norwich. Sat, 13. Ben Smith (Stalham) 136-13-0, 18 carp, pellet waggler, 8mm banded over 6mm feed; Simon Elliot (Daiwa Angling Direct Suffolk) 131-1-0; Dave Jarvis (Daiwa Angling Direct Suffolk) 109-6-0; Bob Gill (Barford Tackle) 68-15-0. Cross Drove, Hockwold, Norfolk. Wed, 19. Jim Barrowman (P W Angling) 75-12-0, carp and F1s to 8 lb, 14.5m, pellet and corn, peg 52; Mark Pollard (Shimano Stanjays) 73-6-0; Adam Hayward (Cross Drove) 70-10-0; Rodney Finch (Deben) 69-14-0. Sat, 19.Mark Pollard (Shimano Stanjay) 74-5-0, carp to 9 lb and F1s to 5 lb, pellet & corn, 14.5m, peg 50; Stewart Bracey (Shimano Dynamite) 45-0-0; Dave Pearce jnr (Wisbech) 41-10-0; Ben Townsend (Cross Drove) 39-4-0. Sun, 24. Dave Reeve (Daiwa Angling Direct) 67-13-0, carp to 12lb and F1s to 4 lb, corn and meat, 13m, peg 38; Bruno Norman (Kev’s Tackle) 57-14-0; Rodney Finch (Deben) 48-4-0; Jim Barrowman (P W Angling) 47-13-0; Dave Pearce jnr (Wisbech) 46-10-0; Alan Tuck(Van den Eynde) 37-7-0. Decoy Lakes, Whittlesey, Cambs, Tues, 21, Beastie Lake. Chris Barley (Finedon) 130-2-0; all F1s and small carp, poled pellet and maggot, peg 8; Smug Smalley (Decoy) 127-5-0; Tony Dawson (Bait-Tech) 108-0-0. Sat, 16, Cedar Channel. Richard Lofthouse (Decoy) 142-7-0, barbel and carp to 6 lb, poled worm and caster, peg 1; Martin Freeman (Marukyu) 123-9-0; Nigel Baxter (Bag’em) 100-0-0; Jon Whincup (Bait-Tech) 99-8-0. Deeping St James AC, Les Wiles Cup, Stretton Lakes, Cambs. Sun, 17. Ray Torrington (Deeping St. James AC) 56-9-0, carp, hair rigged corn and meat; Jason Wilmer (Deeping St. James AC) 36-10-0; Neil Dobbs (Deeping St. James AC) 29-10-0. Foston, Match Lakes, Lincolnshire. Wed, 12. Terry Crouch ( Newark ) 131-12-0, carp to 12 lb, floating bread flake, Hawthorn 15; Paul Kimberley (Team Zimba) 125-4-0; Graham Eden (Mansfield) 88-8-0. Sat, 14. Ian Palfreeman (Phil’s Bait & Tackle) 168-8-0, 34 carp to 10 lb, poled dog biscuit, Ash Pool 9; Phil Morris (Notts AA) 148-4-0; Chris Mawer (Nightingale AC) 130-0-0; Graham Eden (Mansfield) 121-0-0. Graham’s Pond, Huntingdon, Cambs. Sat. 10. Ian Thornton (Graham’s Pond) 6-10-0, carp, poled maggot; Stu Redman (Sensas) and Adam O’Neill (Graham’s Pond) both 2-12-0. Head Fen, Pymoor, Cambs. Sun, 7. Jimmy Brooks (Anglers Corner) 160-0-0, two bream, two tench, rest carp, margins, meat & crumb,Trevs Lake; Alan Newton(Anglers Corner) 90-8-0. Littleport AA, Great Ouse, Pymoor pegs 10-34. Sun, 25. Phil Houghton(Littleport) 3-3-8, single bream plus bits, feedered worm to far bank, peg 24; Jess Rocket (Littleport) 1-15-8; Simon Pointer (Littleport) 1-13-0; Dave Clapton (Devizes MG) 1-8-8; Darren Belham (Littleport) 1-1-0; Ian Asplen (One Stop) and Ken Rolfe (Bill’s Tackle) both 0-10-0. Kings Lynn AA, Great Ouse, Ten Mile Bank (National H section), Browns Farm. Sat, 22. Jim Randell (Sensas) 2-5-0, single bream, far bank feeder; James Cartey (Devizes MG) 1-15-0; Robin Guy (Devizes MG) 1-10-0; Nigel Franks (Devizes MG) 1-0-0. Lakeview Fishery, Holwell, Leicestershire. Sat, 12, Veterans, Serpent Pool. Roger Holmes (Lakeview Select) 66-6-0, carp and silvers, poled pellet; Keith Daws (Lakeview Select) 59-5-0; John Cook (Lakeview Select) 54-4-0. Wed, 10, Veterans, Stream and River Pools. John Cook 105-0-0, carp and silvers, poled pellet; Roger Parnell (Lakeview Select) 103-0-0; Keith Daws (Lakeview Select) 98-0-0. Long Eaton Fed Summer League, Erewash Canal, Ilkeston, Derbyshire. Sat. 21. Ben Sharratt (Shakespeare) 7-15-0, perch from 4–6 oz plus a near-5 lb bream, poled worm below Gallows Lock; Pete Allwood (Long Eaton Fed) 5-7-0; Nigel Ellis (Matlock AC) 4-0-0; Darren Crosby (Long Eaton Fed) 3-9-0; Sam Barker (Ilkeston) 2-15-0; Ron Scales (Notts AA) 2-7-0. Sherwood Forest Fishery, Edwinstowe, Nottinghamshire. Wed, 25, Holmedale Lake. Andy Topham (James Maude Linden AC) 94-14-0, 30 carp, poled pellet, peg 14; Daz Staley (Sub Fish Tackle) 85-12-0; Mick Langton (Sherwood Forest) 72-12-0; Kevin Chaplin (Sherwood Forest) 71-11-0; Matt Malia (Wickersley Angling Centre) 65-8-0. Tues, 14, Sherwood Lake. Mark Watts (Sherwood Forest) 80-4-0, 15 carp to 11 lb and ten bream to 3 lb, poled worm, peg 41; Dave Round (Woodhouse Angling Centre) 72-5-0; Steve Richards (Sherwood Forest) 60-11-0; John Wooff (Sherwood Forest) 45-13-0. Stoppo’s Lake, Lullington, Swadlincote, Derbyshire. Tues, 12. Gary Mann (Stoppo’s) 21-8-0, carp/bream, poled maggot; Paul Croombe (Stoppo’s) 18-12-0. Sat, 12. Mick Harvey (Stoppo’s) 77-8-0, carp/bream, poled maggot/sweetcorn; John Woollett (Stoppo’s) 40-12-0; Paul Croombe (Stoppo’s) 37-0-0. Westwood Lakes , Wyberton, Boston , Lincolnshire. Thurs, 32, over-50s, Skylark Lake. Paul Harsley (Dave’s Peg) 134-4-0, carp to 6 lb, F1s to 2 lb, poled pellet, peg 26; Brian Thompson (Westwood Lakes) 91-6-0; Barry Whitworth (Westwood Lakes) 70-12-0; Ken Clarke (Westwood Lakes) 70-10-0; Spike Milligan (Garbolino Lincs County) 68-6-0. Tues, 42, £1000 Qualifier, Skylark Lake. Paul Ogilsbee (Westwood Lakes) carp, F1s, ide and tench, poled pellet, peg 10; Paul Harsley (Dave’s Peg) 97-14-0; Brian Thompson (Westwood Lakes) 84-10-0; Daniel Abbott (Westwood Lakes) 72-12-0; James Newell (Westwood Lakes) 59-2-0.